ECCLESIUS, the Bishop of Ravenna from 521 until his repose 532. St. Ecclesius commenced the construction of San Vitale, and also accompanied Pope St. John I (18th May) on his trip to Constantinople on behalf of the Arian King Theodoric the Great. ETHERIUS, sixteenth Bishop of Auxerre serving that See from 563 until his repose 573. St. Etherius promoted the expansion of monasticism in his diocese and safeguarded the Church from meddling by secular authorities. 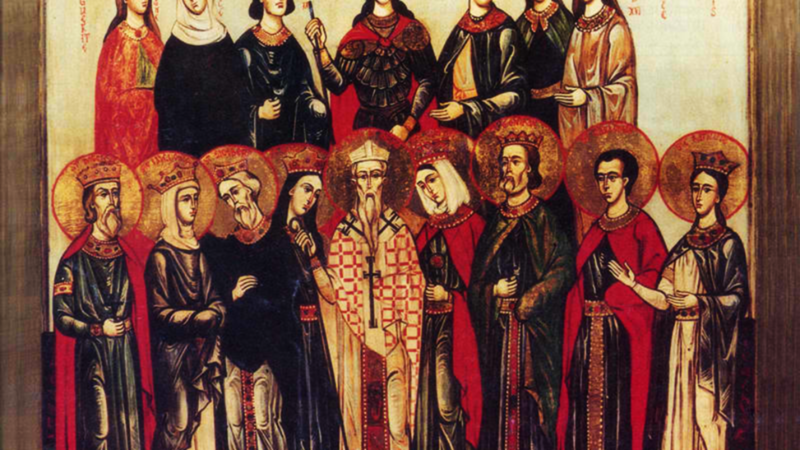 GEORGE, FELIX, AURELIUS, NATALIA, and LILIOSA, a group of martyrs in Cordoba under the Caliph Abd ar-Rahman II (852). Aurelius and Felix, and their wives, Natalia and Liliosa, were Spaniards. George, a Hierodeacon from Palestine, was offered a pardon since he was a foreigner, but chose martyrdom for Christ. MAURUS, PANTALEIMON, and SERGIUS, Maurus, probably a native of Bethlehem, is believed to have been sent by the Apostle Peter (29th June) to be the first Bishop of Bisceglia on the Adriatic. Imprisoned by orders of Emperor Trajan, he was placed in the custody of Pantaleimon and Sergius whom he converted to Christianity. St. Maurus was beheaded Pantaleimon and Sergius were crucified circa 117.